Gabriel Glenn Photos, News, and Videos | Just Jared Jr.
Paris Jackson and Gabriel Glenn step out for a romantic stroll with their pups on Thursday (April 11) in Los Angeles! The couple looked casual and comfortable together as they walked their dogs around a neighborhood in LA. Paris was boho perfection in a striped sweater dress, boots and round sunglasses with pink and purple lenses, while Gabriel wore jeans and a t-shirt. Paris Jackson and Gabriel Glenn are such a cute couple. 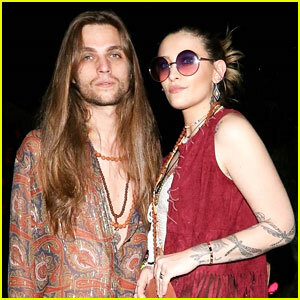 The singer-songwriter, actress and activist and her The Soundflowers bandmate and boyfriend were seen grabbing supplies at Ralph’s on Wednesday (April 3) in West Hollywood, Calif. – which was also her 21st birthday! – for an anticipated camping trip. Gabriel was spotted buying a small bouquet of flowers for Paris, and the pair stopped for a small kiss before heading out. Later that day, she provided an update on her Instagram: “camping plans fell through 😞 but at least i got to get some fish tacos with two of my favorite granolas in the whole wide [w]orld,” she wrote. Paris Jackson and Gabriel Glenn share a sweet moment outside of their first public show as the Soundflowers! The model and actress and her boyfriend took the stage at The Mint on Thursday (March 30) in Los Angeles. Paris threw up a peace sign for the cameras and signed autographs for fans outside of the live music venue, sporting a white crop top, red pants, brown boots, a colorful scarf and bag, circular purple shades, and an assortment of jewelry. Other friends and family in attendance included Paris‘s mom Debbie Rowe, her younger brother Prince Jackson, as well as Chris Brown.